Persistence Market Research presents a detailed and all-encompassing report on the hyperthermia treatment for cancer market titled ‘Hyperthermia Treatment for Cancer Market: Global Industry Analysis and Forecast, 2017–2025’. The report starts with an executive summary that states the market overview with pertinent market numbers and forecasts along with the CAGR for the period 2017 to 2025. The executive summary also contains the segment wise forecasts by device type, by end user, by application and by region and gives the market revenue spilt for the year 2016. The executive summary also lists the drivers, challenges and trends in brief impacting the hyperthermia treatment for cancer market, about which the report talks in detail in another exclusive section. The executive summary also contains a list of key market players operating in the global hyperthermia treatment for cancer market. At the end of the executive summary, there is a concise Persistence Market Research analysis on the overall market approach adopted by key market players in this market. Target geographies talks about the regions that are most lucrative in the global hyperthermia treatment for cancer market and this subsection also contains the differentiating strategies adopted by leading market players to stay in the pole position in this market. Market introduction follows the executive summary and this section defines hyperthermia treatment for cancer devices. This section also contains a write up on the inclusions and exclusions that have been made in the scope of this report. Persistence Market Research has only included the market of hyperthermia devices that are used for local, regional or whole body hyperthermia treatment procedures for cancer. Hyperthermia devices are used in the hyperthermia treatment procedure, where such devices are used to heat the tumor to 42?C or a higher temperature using different type of focused waves. Other thermal ablation therapy procedure devices such as radiofrequency ablation, cryoablation therapy, laser ablation therapy and microwave ablation have not been included in this report. After the market taxonomy, there is a section devoted to the pricing analysis by region of the different types of hyperthermia devices used for in treatment. A section of the report analyzes in detail the market dynamics of the hyperthermia treatment for cancer market. In this section, various drivers, restraints, opportunities and applicable trends are stated in detail that give the report audience a clear view of the various factors that are encouraging and hampering the growth of this market and the latest happenings and trends associated with this market. After this, there is an important section dealing with the data that states the improvement in breast cancer results with hyperthermia. The subsequent sections of the report state the global hyperthermia treatment for cancer market analysis and forecast by device type, end user, application and region. In these sections, important information regarding the market in the form of Basis Point Share analysis, year-on-year growth projections and market attractiveness analysis is given. An entire section of the report focuses on the competition landscape of the global hyperthermia treatment for cancer market. The competition landscape gives a dashboard view of the key companies operating in the global hyperthermia treatment for cancer market along with their important information and broad strategy adopted to stay as leaders in the hyperthermia treatment for cancer market. Each of the leading companies is also profiled individually and important information about the company including company description, product portfolio along with key developments concerning the company and strategic analysis is presented. This section also contains a comprehensive SWOT analysis of each leading market player. This competition landscape is the most important section of the report as it imparts a deep understanding of the leading companies operating in the global hyperthermia treatment for cancer market and is valuable for new entrants in the field to get a learning about how the companies are leading this lucrative market and also for established market players to get a better understanding about their competitors. Persistence Market research has used a model approach to estimate the hyperthermia treatment for cancer market. Bottom up approach is used to understand the number of installed base, replacement rate, average life span of devices and average number of devices installed per hospital. The number of hospitals per country have been considered to derive the total number of hyperthermia devices installed. Weighted average selling price is considered to estimate the market size of various products mentioned in the scope of the study. The country price is captured with the local currency. The local currency figures have been converted to USD to offer forecasts in a consistent currency standard. Furthermore, Persistence Market Research has taken into consideration the latest annual exchange rates to reflect the impact of the most recent global economic conditions. 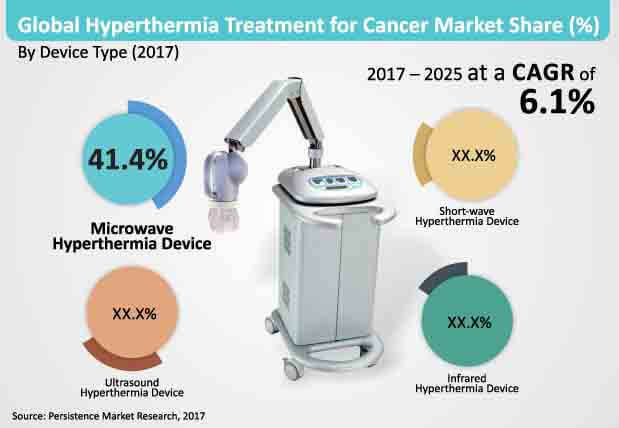 Further, Persistence Market Research has also analyzed the global hyperthermia treatment for cancer market through extensive primary research to understand the usage patterns, historic trends, problems faced by professionals, the required product developments, and most preferred products. Key opinion leaders considered in primary research include experienced healthcare professionals in various healthcare facilities at the country level. These estimates are further validated through inputs from industry experts including manufacturers, distributors and suppliers. Persistence Market Research has conducted primary research interviews at the country level with a spilt of 65% demand side and 35% supply side. Extensive secondary research has been carried out to understand the lifespan of devices, adoption rate, regulatory scenarios, average selling price, reimbursement scenario, etc. Persistence Market Research has also analyzed various companies’ websites and press releases to fetch substantial information regarding the market size and key market developments. Global hyperthermia treatment for cancer market revenue is projected to register a CAGR of 6.1% during the forecast period (2017–2025). The global hyperthermia treatment for cancer market is estimated to be valued at US$ 99 Mn in the year 2017 and is slated to reach a market value close to US$ 160 Mn in the year 2025. In terms of revenue, the microwave hyperthermia device segment was the dominant product type segment in the global hyperthermia treatment for cancer market in 2016. The segment is expected to further gain traction during the forecast period owing to its ability to transmit energy from antenna to cancer cells without getting stuck in fat layers. The spread of cancer is on a constant rise all over the world. As per the projections of the World Health Organization, the number of deaths from cancer all over the world will reach around 13.1 million by the year 2030. The data from WHO also suggests that global cancer prevalence will increase approximately 75% during 2008 – 2030. This rapidly growing incidence of cancer all over the world will lead to an increased number of patients opting for cancer therapies. This in turn is likely to boost the number of patients undergoing hyperthermia treatment thereby driving the growth of this market. There is a growing awareness regarding the therapeutic effect of hyperthermia on various types of malignant diseases and this in turn is likely to increase the revenue growth of the global hyperthermia devices market. The increasing number of experts in the field of hyperthermia are creating awareness among patients regarding the use of hyperthermia to destroy tumor cells and to increase drug absorption in the target cells by using hyperthermia treatment in combination with chemotherapy. Various clinical trials with hyperthermia in combination with radiation therapy have proved the ability of hyperthermia treatment to increase the human tumor temperature, and it is proved that a combination of hyperthermia and radiation therapy is superior and more effective than standalone radiation therapy alone. The advantage provided by hyperthermia treatment is expected to fuel the global hyperthermia treatment for cancer market. High cost of hyperthermia treatment procedure as compared to other cancer procedures is a main factor hampering the growth of the hyperthermia treatment for cancer market. The average charge for hyperthermia treatment in the United States is around US$ 50,000 for each cancer type. In a majority of cases, hyperthermia treatment is taken as combination therapy along with radiation or chemotherapy, making it more expensive for patients to afford such kind of treatment. Microwave Hyperthermia Device segment is estimated to account for over 40% revenue share of the global hyperthermia treatment for cancer market by 2017 end and is expected to lose 99 basis points in its market share by 2025 over 2017. Ultrasound Hyperthermia Device segment is estimated to account for close to 25% revenue share of the global hyperthermia treatment for cancer market by 2017 end and is expected to gain 139 basis points in its market share by 2025 over 2017. Among the device types, the Short-wave Hyperthermia Device segment is projected to register the highest CAGR of 7.0% in terms of value in the global hyperthermia treatment for cancer market during the forecast period. Countries like China and India have a huge population and high incidence of cancer cases. However, the number of facilities and experienced practitioners available in these countries to provide effective treatment for cancer are relatively low. On the other hand, growing incidence of cancer in China and India is expected to offer lucrative growth opportunities for hyperthermia device manufacturers. The number of hospitals, cancer centers and clinics that provide cancer treatment is gradually increasing in these countries, which translates into an opportunity for hyperthermia device manufacturers to introduce less complicated, cost-effective and easily available products specifically developed for emerging economies.